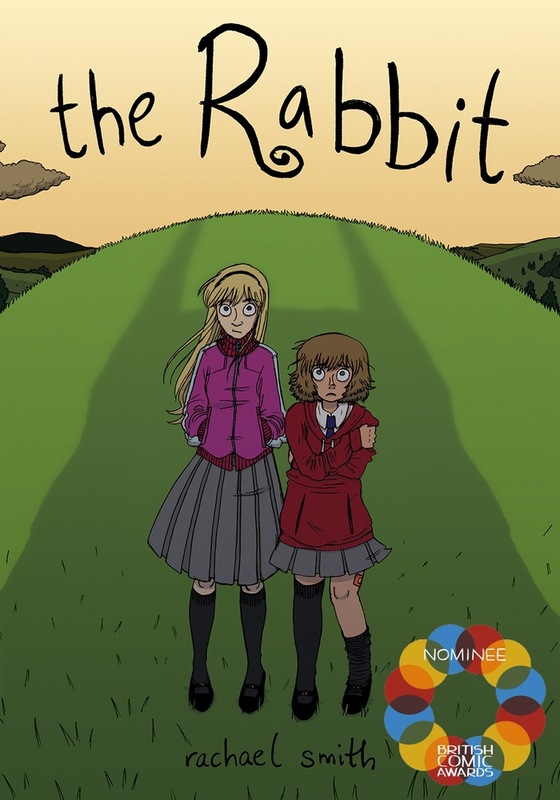 In The Rabbit, Rachael Smith makes a departure from telling farcical stories of young people dealing with fitting into the modern world and instead dips into psychological horror. Leaning heavily on Lewis Carroll's Alice's Adventures In Wonderland as a starting point, it follows the adventures of sisters Eleanor and Kathy as they've run away from home and are living in the wilderness. Smith thrusts the reader into their adventure in media res, providing bits of context and clues as to how and why they got there along the way. In every one of Smith's books, the main characters have a transformative arc, wherein lessons are learned and follies are corrected. What transforms the characters is certainly the circumstances related to the plot, but that's just the mechanism of change. What really transforms them is that they learn to accept the truth about themselves, something about which they've been in denial. 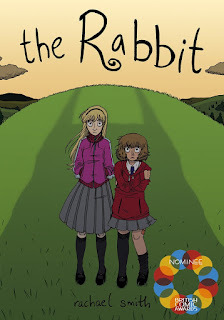 In The Rabbit, Eleanor views herself as Kathy's protector but also sees Kathy as her subordinate, an accessory piece in her own (literally) heroic narrative where she's slaying a dragon or has become a dragon and is ready to burn a nearby village down. 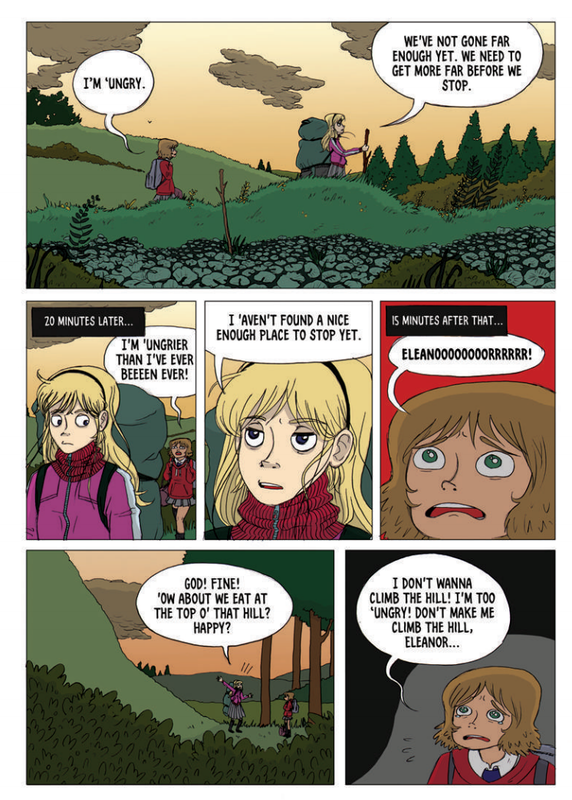 Nowhere is that more evident than in "the monster game", in which Eleanor is a monster who relentlessly scares her sister. The book sees them wandering around, dealing with some neighborhood boys who discover them in the forest and then discover a tiny rabbit that they've accidentally harmed. Just like things went upside-down for Alice when she discovered a rabbit, so too do Eleanor and Kathy's lives get much weirder when the rabbit (whom Kathy names Craig) arrives. Soon, they discover the rabbit can talk, and it has a voracious appetite. With the rabbit promising them a safe cave to stay in, they accompany (and start wheeling around) the ever-more demanding creature. 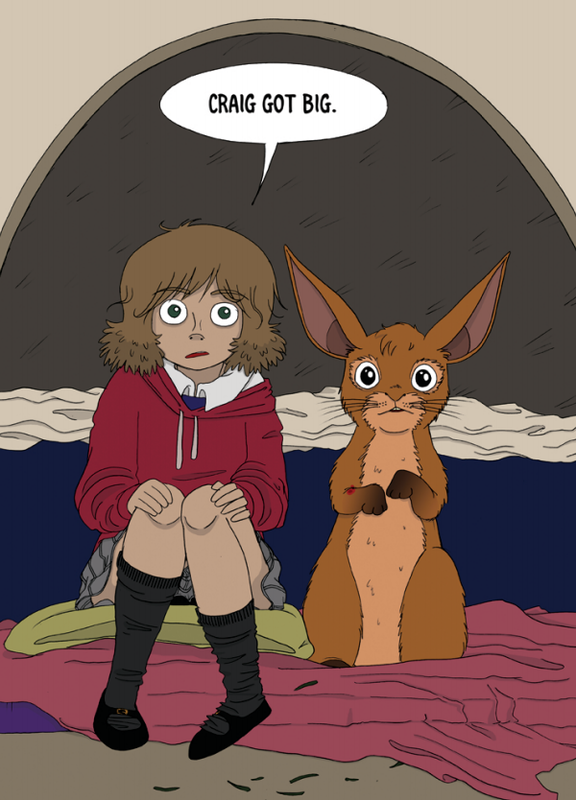 The scene where the now-gigantic and toothy rabbit demands that they come into the rabbit's warren (not exactly a cave!) and we see a bacchanal of rabbits and other rodents in progress is hilariously creepy. One running plot device in the book is that the girls' father is continuously trying to call Eleanor, and she keeps declining the call. When the rabbit discovers she has a phone, he takes it from her and demands they steal food and liquor from the local convenience store. Their story has now become an anti-heroic quest, and when they devour food at the store and fall asleep, they've clearly crossed a line. Despite everything, they (and Eleanor in particular) doesn't make the transition in character until she finds the boys again after the rabbit has terrorized them and they run away, chastising them for running away. That dawning bit of awareness leads to the highly effective climax of the book, when Craig and an entire host of frightening critters are chasing them through the forest, as Eleanor finally taking the call from her father literally saves the day. Along the way, the dynamic between the sisters changes for the better. Exactly what caused them to leave him is only hinted at, but it had to to do with the death of their mother and the reaction of their father. But that was neither here nor there, as the book was really about the denial of reality and the retreat into fantasy and denial that is part of that, as well as shifting negative emotions onto a trusting victim. Using a lushly-colored forest as an almost storybook backdrop was highly effective in getting at this, especially with lots of silent beats thrown into the story that made the reader stop and slow down. Smith has become adept at using the restraint of these silent beats to make the frantic climaxes that are her trademark all the more effective.